For Cummings School students, beagles are among their best teachers, helping them learn such skills as conducting physical exams, performing ultrasounds and taking X-rays. Eventually, the tables are turned, and the veterinary students teach their canine instructors about life after the classroom. 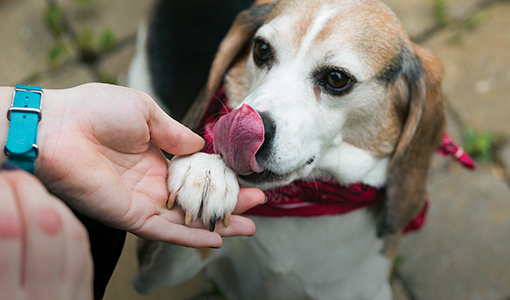 The school has 20 teaching beagles, and first-year veterinary students take on the task of socializing the dogs so they can go to permanent homes. For the course Human-Animal Relationships, they take the dogs on daily walks and help them master basic obedience skills. The beagles come to Cummings School from other research institutions as young adults; all were bred specifically for research. Beagles are popular laboratory dogs for the same reasons they are popular pets: They are small, docile and get along well with other dogs and humans. Because the beagles grow up in kennels, most have behavioral issues that need to be addressed before they can become someone’s pet. “They can be challenging to housebreak, because they have never gone to the bathroom outside on a leash,” McCobb says. The students train the dogs to sit, stay, lie down and respond to their names. They also take the dogs out daily to play off–leash in groups. “The students have proven to be as gifted at teaching as their canine instructors: Every beagle has made the leap from class to couch. Kimberly Flink, the research veterinary technician who runs the socialization program, estimates that over the past five years, she has placed 40 beagles in permanent homes. “We have a 100-percent adoption rate,” she says. The program is a win for students as well. “Not every student has owned a dog before,” says Eric Littman, V17. “This lets them get that hands-on experience with small animals without having to commit to having a pet. Interested in adopting a teaching beagle? Email Kimberly Flink at kimberly.flink@tufts.edu or Sherry Ann Castonguay at sherry.castonguay@tufts.edu.